Your participation in this occasion supports our education and health care initiatives, and contributes to the empowerment and quality of life of women and children in South Africa. 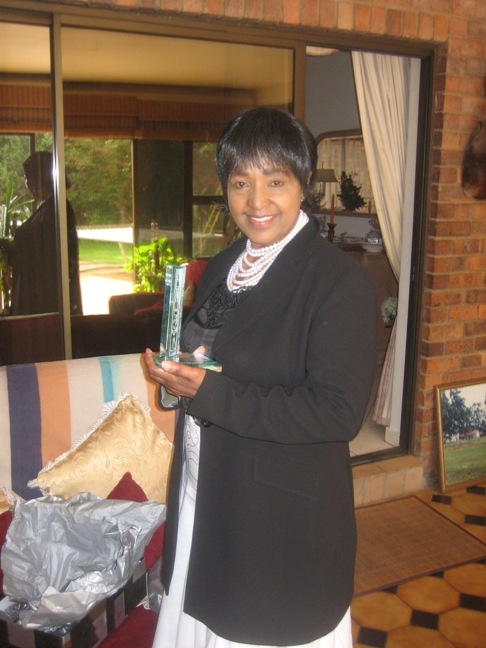 The award was originally to be presented to Madikizela-Mandela on Saturday September 16, 2006 at the 10th annual South African Women for Women Awards Gala before a death in the family prevented her from attending the ceremony. Madikizela-Mandela is known to her supporters as Mother of the Nation. Famous for her outspoken and often controversial opposition to Apartheid, the ex-wife of former South African President Nelson Mandela spent much of her husband’s imprisonment exiled and confined to the town of Brandfort in the Orange Free State, except for the times she was allowed to visit her husband at the prison on Robben Island. Adriaans traveled to South Africa not only to present Madikizela-Mandela with her award, but also to attend the 75th birthday celebration for Archbishop Desmond Tutu. The celebration for Tutu was attended by many of South Africa’s most influential personalities, including Nelson Mandela, as well as a number of Hollywood celebrities, including Samuel L. Jackson, Alfre Woodard and Carlos Santana. South African Women for Women's mandate is inspired by the book No Future Without Forgiveness, by Archbishop Desmond Tutu. The work supported by SAWW fosters the spirit of co-operation and mutual respect with the goal of transcending the past in creating a foundation for the future. As women work together to overcome the racism and sexism that permeates society, SAWW is proud to be part of that rebuilding.